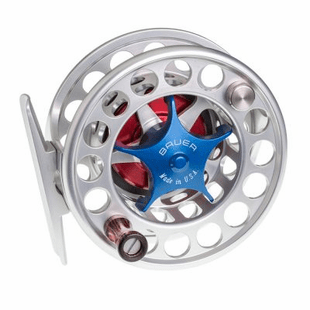 Designed and constructed in the United States - fished around the world, Bauer Fly Reels are precisely machined from aerospace bar stock aluminum and stainless steel. 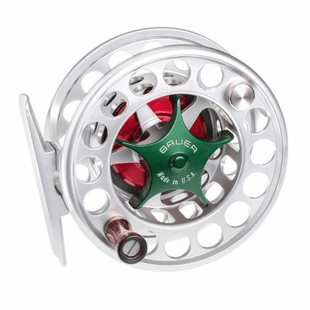 Bauer fly reels and spare spools are engineered by some of the experienced and passionate folks in the fly fishing industry - trusted by anglers fishing in some of the most exotic angling destinations across the globe. Built upon the pillars of innovation and technology there sits the Bauer Fly Reel. More than a decade ago, John Bauer brought the large arbor fly reel to the stage and revolutionized fishing forever, and to this day his products continue to lead the way in fishing excellence. Large Arbor Design: By increasing the width and diameter of fly reels such as Bauer has done, you achieve higher retrieval rates and optimum spool depth to width ratio which gives you a fly reel that is engineered to perfection. Carbon Fiber Drag System: Silky smooth performance year after year and in any environment. With a high quality drag system such as Bauer�s, there is no maintenance required. Carbon Fiber drag systems function perfectly in fresh and saltwater environments, so you can take your Bauer fly reel anywhere you wish. Clutch: An often overlooked aspect of fly fishing reel mechanics is the clutch. Bauer�s patented one-way clutch means the drag system engages very easily. This means that when you are fishing with light tippets for trout and hook a big fish, your tippet will not snap when you set the hook because of heavy tension on the line caused by a delayed engagement of the drag system. A precise clutch means everything from the hook on your fly to your drag system is connected and in perfect harmony. Lightweight: Bauer�s fly reels are manufactured to be as light as possible without sacrificing strength or durability. This is ideal in many situations, but specifically when you are pairing a reel with a lightweight modern fly rod. All Bauer Fly Reels are designed to work in any environment. Their durability is unmatched and you can fish their products anywhere from the Madison River to the Seychelles. Bauer SST Fly Reel - A narrow profile frame and a large arbor spool coupled with a zero backlash carbon fiber drag system make this a fabulous reel from 2 weights to 9 weights. Available in a wide variety of color options and combinations. Bauer RX Fly Reel - This is the upgraded and advanced Bauer Rogue Reel we all loved from years past. A sealed carbon fiber drag system and a lightweight frame make this reel a favorite for us on our local rivers in Oregon but they will work in any saltwater environment as well. A cool aspect of this reel is that the RX 5, 6, and 7 have double the drag strength than the original Rogue Reel. Available in a wide variety of color options and combinations. Bauer CFX Fly Reel - The Mckenzie CFX is an absolute classic. Perfect for anything from 3 weights to 9 weights, this is a versatile reel with myriad applications. It is lightweight, features a zero backlash carbon fiber drag system, and has a sleek closed-back design. Available in a wide variety of color options and combinations. 10% of every reel sold goes to fish restoration. Bauer is also a supporter of the Native Fish Society, Waterwatch, and the Rogue Riverkeepers.